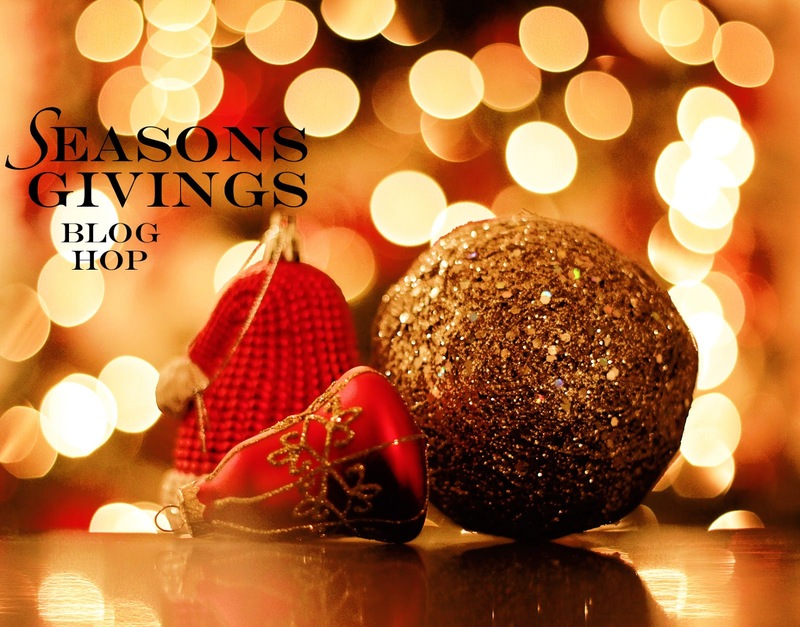 Welcome to the Season's Giving Blog Hop! I, along with many other gals in the crafting community, am joining in a blog hop celebrating our hobby and offering up a goody to be given away. 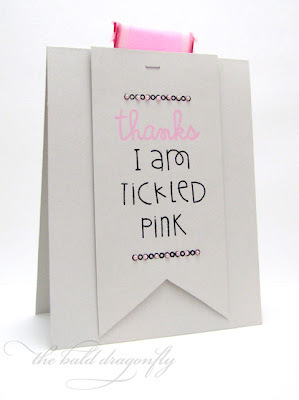 I'm tickled pink that you stopped by today, whether it is your first time or if you are a faithful visitor here! If you are following the hop in order, you should have arrived from Jessie Rone's Blog! I thought I would showcase some highlights of my year, as I do every year on my blog at this time. I am so fortunate to be part of this community and have made countless friendships that will never be forgotten. I am also blessed to have so many opportunities to showcase the results of my addictive hobby. In January, I was published in Lawn Fawn's Year Two Catalog. In March I joined The Craft's Meow as a Stamp Illustrator. In April my first set for The Craft's Meow debuted, Inspired by Audrey. 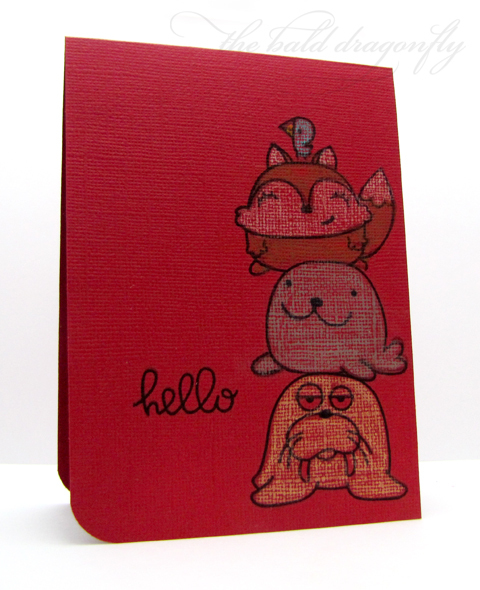 In May I began my first term with Artful Delight to showcase their Card Kits. In July I joined Lil' Inkers Designs as one of their Graphic Designers. In August, I was Paper Smooches Guest Designer. In September I was named as a Royal Ribbonista for May Arts, and guest designed for Market Street Stamps. In October I helped in the release of CAS-ual Fridays Stamps and went out of retirement to become a Girl Friday at the CAS-ual Fridays Challenge Blog again! In November I guest designed for Fresh Squeezed Stamps. Throughout the year, I also worked with many designers to update the look of their blog. So proud of our collaborations! There are so many other opportunities that I experienced in 2012, and I thank you, each of my readers, for joining in the journey with me. Why don't we ring in the new year with some string and bling? 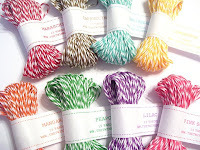 I have a sampler's pack of The Twinery's classic colors and a plentiful package full of new Zva Crystals to give away! To enter, please leave a genuine comment on what you'd like to see here on The Bald Dragonfly for 2013. I'll take each comment to heart (as I always do!) and try to make your suggestion possible. You'll have to come back to see if you've won, though, as I'll be announcing my winner in a week. Your next stop is Lori Techler's Blog! Every creature was hurting, even the mous. The patch on his jacket said "US Postman." Then quickly he stuffed the into our mailbox. Here's Levitz's and Target's an Merveyn's - all here! I know, I know, another clean and simple Artful Delight post! However, when I sat down to make these I realized I used up most of the holiday patterned paper from the kit for my holiday cards (which I guess I will save for next year because I didn't get them signed or put in the mail)! 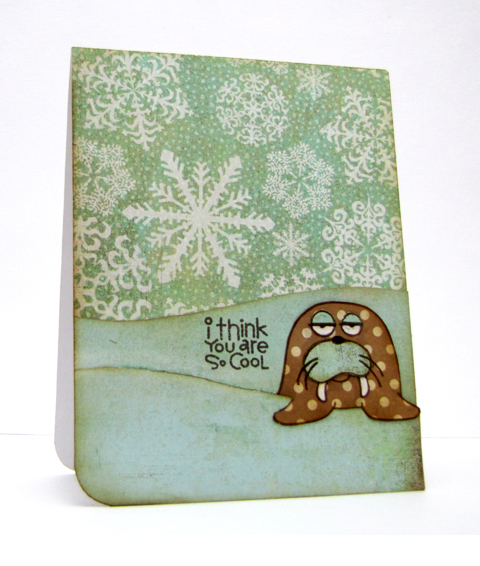 Plus, I wanted to showcase the winter side of the December Artful Delight Card Kit. And third, I love that most of the card kits include versatile stamps and many sheets of solid cardstock so that if you aren't into a lot of embellishments, you STILL get your money's worth from the kit. 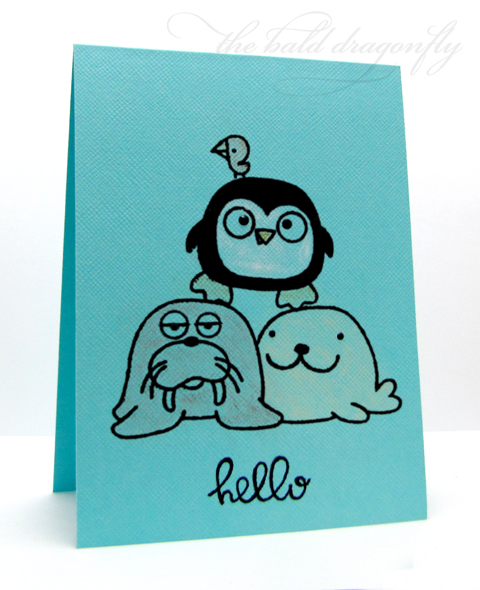 You could easily paper piece these creatures for a more detailed card, that would be totally cute. These cards feature creatures that were colored lightly with colored pencils. It's a technique that I haven't tried, or tried in a long while, and although the results probably weren't what I was thinking, I think they are still fun. Counting down the days...the boys have been waiting patiently, or not so patiently at any given hour, for Santa to come. Only one more paper ring to remove from the chain that lets them know when the 24th arrives! 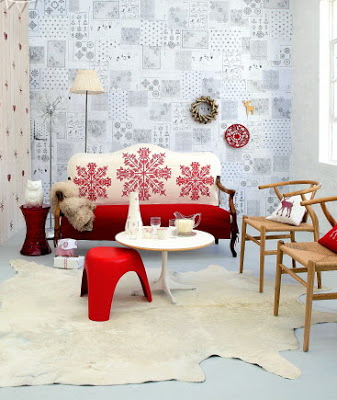 Mod, clean, graphic was the avenue I took on today's holiday card. 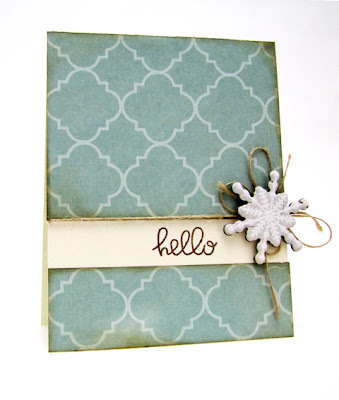 I used Lifestyle Craft's Nesting Circle Dies to achieve the look of a shiny ornament. I was heavily inspired by this card set here. I changed up the colors and went more geometric. Oh my goodness, I was in heaven when these arrived on my doorstep, there are so many sizes available in the one set, they are thin and lightweight, and cut perfectly. I've been wanting circle dies for forever, as punches were just taking up so much room, and I've got to say, these Lifestyle Craft's ones are the way to go. Plus, the inspiration has been in my files just waiting for nesting circle dies.... Lifestyle Crafts has given me a code to share with you...enter the keyword DRAGONFLY for 20% off! 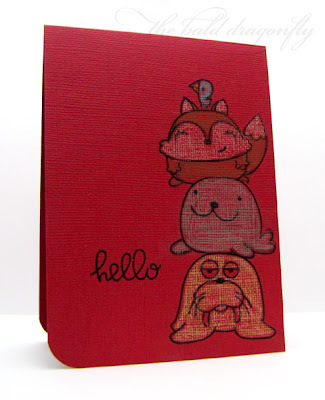 I'm super excited because I just learned that Lifestyle Crafts is coming out with a whole slew of new QuicKutz Dies and GooseBumpz embossing folders! I'm entering this mod creation in Simon Says Stamps Merry Christmas Challenge! I hope you enjoy your holiday, take some time to spend with family and loved ones just as I have the chance to do. My father's wise winter advise was to never taste the colored snow, but he didn't mention anything about the sparkly white snow! You know, the fresh fallen, sun glistening, beautiful freshly fallen snow that sparkles even in the moonlight? Love that snow. 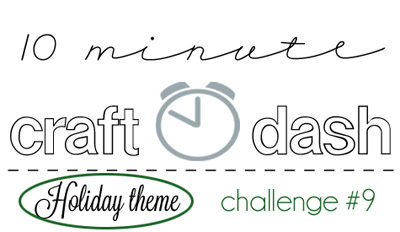 CAS-ual Fridays has teamed up with the 10 Minute Craft Dash Challenge for a whole two weeks! Create a clean and simple holiday creation in under ten minutes! (You can gather your supplies before hand). The sponsor this week is CAS-ual Fridays Stamps! Link up to both challenges for double the fun, and double the chance to win a gift certificate to CAS-ual Fridays Stamps! My card took exactly nine minutes and one second to create (I used my handy dandy stop watch on my phone, which I figured out just for this challenge...). 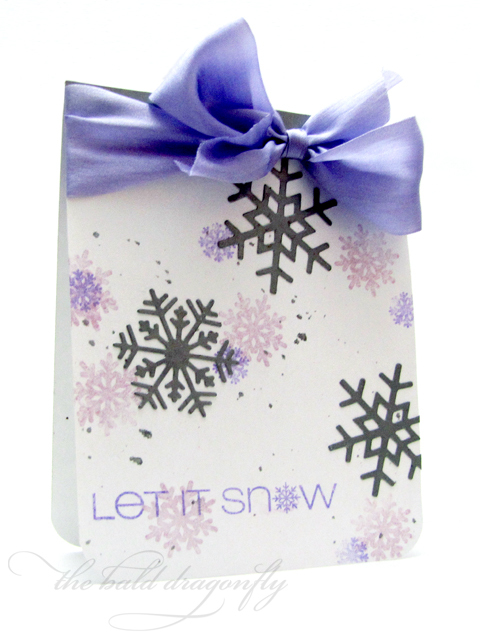 I had a cut and folded cardstock base ready as well as some silver snowflakes die cut from the latest Lil' Inker Designs release. I used CAS-ual Friday's Snowflake Greetings stamp set to randomly stamp some snowflakes across the card, along with the sentiment and topped the card with a big, loopy bow from May Arts Silk Ribbon. 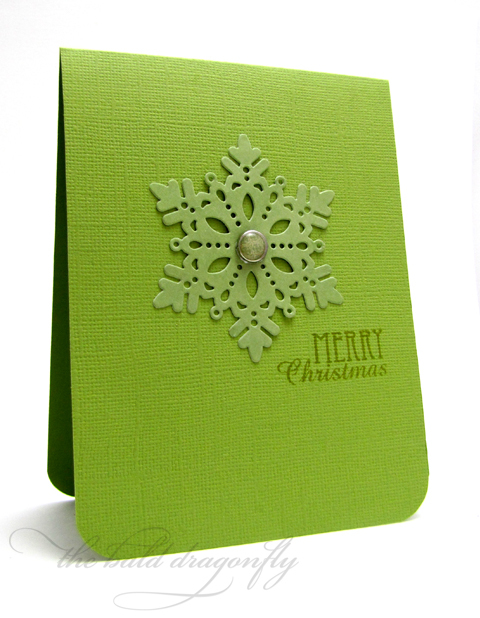 I finished the card with a bit of Pearl Mist Spray and Silver Studio Calico Mist. Oh, and I rounded the corners at the very last second! I hope you get a chance to stop on over at the CAS-ual Fridays Challenge Blog to check out the dashing holiday inspiration from the Girl Fridays and read about the prize and sponsor! Coming to you today buried in the deep depths of snow here in central Wisconsin...It is so pretty outside, but surely it can stop anytime. Six inches is enough, but we are expected to get triple that amount in the next hours. Kelly extended the deadline for cards to be postmarked for sweet Addison by December 30th. 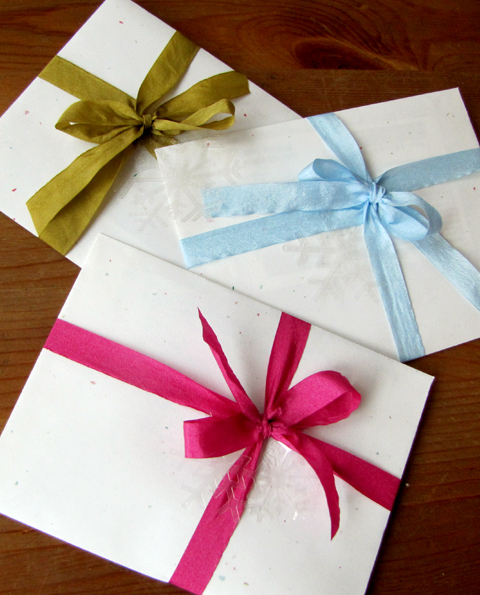 If you have time during your holiday vacation, would you consider making a card or two for Addison? You can find more details by clicking on Addison's picture on my sidebar or clicking here. Kelly provided an update on her blog regarding how Addison is doing, as well as the number of cards she's received so far! Thank you from the bottom of my heart for helping this little girl by brightening her days ahead with your amazing creations. It's crunch time here in our household to get everything done before the holidays. The boys have their school concert tomorrow and have been diligently practicing... At the top of their lungs too-I enjoy hearing their versions of the classics. I realized this past weekend that both of them needed new dress shirts too-the little one has even outgrown the dress shirt the oldest wore only a while ago! I have a trio of snowflake cards today up on the Artful Delight Blog and here, showcasing the lovely embellishments and solid cardstock from the December Card Kit. The large snowflakes were actually dissembled before making their way onto these cards. 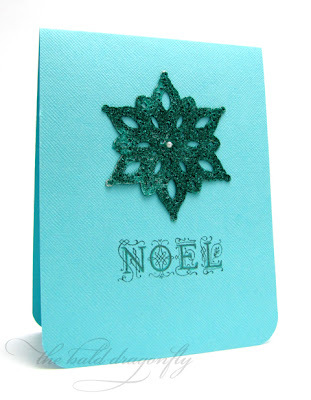 The blue one above I turned over (it was dark green on the other side) and added glue and teal glitter to match the cardstock included in the kit. A small pearl and stamped sentiment (not from the kit), along with rounded corners, finished off the card. Next up is the light green version, this time the center is one of the many small brads from the kit. And finally a red version. My least favorite of the three (because I don't care how my stamped sentiment turned out) but I think still provides a bold, and beautiful look. 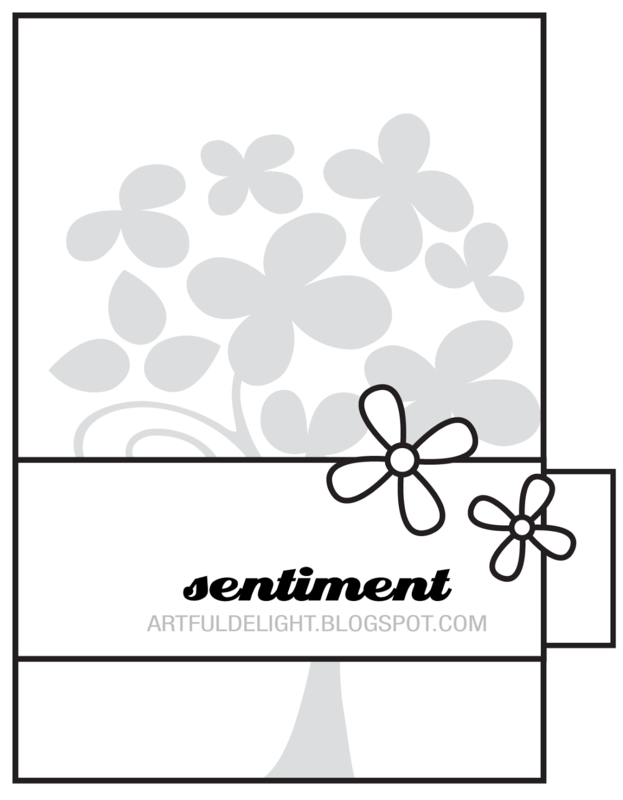 I hope you have a chance to check out this month's Artful Delight Card Kit, and remember to play and link up to the sketch challenges this month before the 23rd! The May Arts Ribbonistas are coming together for week long inspiration posts. Today is Day Two. You should have arrived from Jingle's Blog! The complete posting list from yesterday and today, as well as for the rest of the week, can be found on the May Arts Blog. There are ribbon prizes up for grabs! 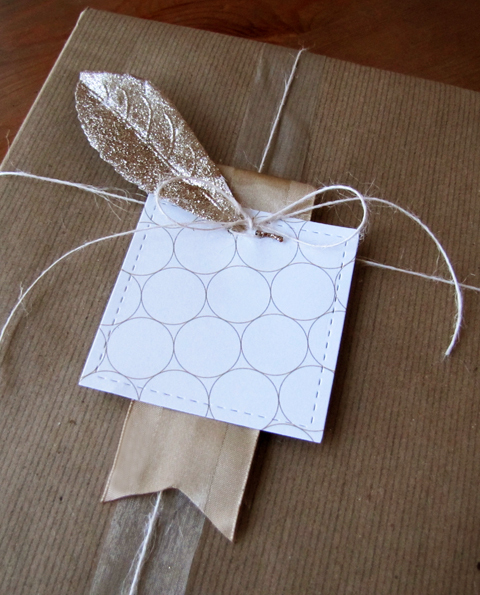 I couldn't resit showcasing May Arts products teamed up with brown paper packages. They just go together like peanut butter and jelly. The first package is done up with class and elegance. 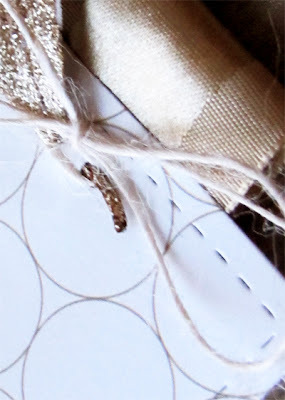 I ran a strip of sheer gold ribbon along the length of the package, added Linen Burlap String on both sides and then topped it with a gold glittered leaf, tag and a loop of gold satin. The above package is more traditional. 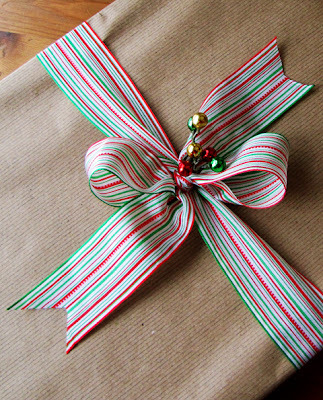 I simply tied a large bow (fishtailing the ends) with the Solid/Variegated Stripes Ribbon and tucked in a few shiny plastic berries. And this package is for the kids. 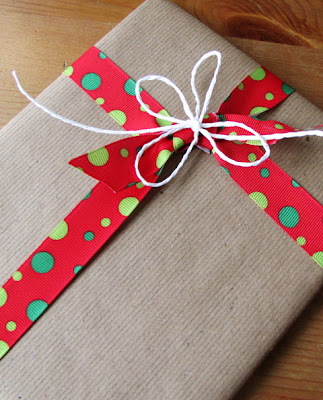 I tied some Grosgrain/Bubble Dot ribbon in a knot around all sides of the package and added a big, fun bow out of white paper cord. Finally, I needed a pretty and unique way to wrap some gift cards and gifts of money, so I wrapped a plain envelope in Solid/Wrinkled Ribbon (chartruese, baby blue and fucshia), tied a large bow and added an acetate snowflake for the finishing touch. Your next stop is Kendra! The days are short and my time is getting shorter and shorter to get everything done before the Christmas Holiday arrives. 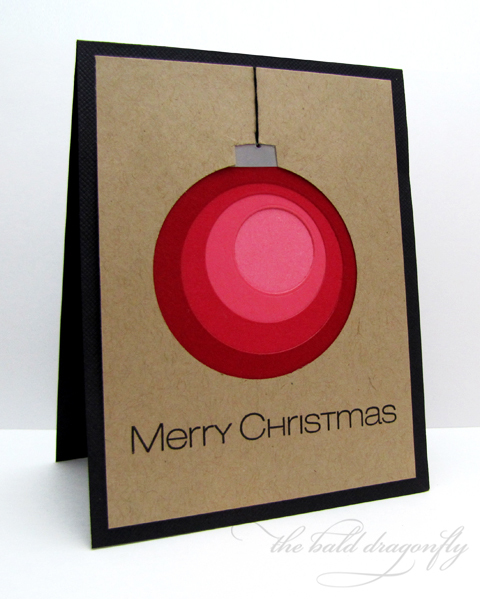 I was in need of a few more quick and easy, and mail friendly, Christmas Cards so I created this one. Looking at the cute little snowman makes me smile. In need of some smiles after the heartbreaking news from Connecticut...those children were the age of my youngest boy. He comes from the Christmas Cheer Stamp Set from The Craft's Meow. What I did was cut a patterned paper panel to size (From Echo Park's Winter Wishes) and mounted that to a bright pink card base, after rounding the corners of each. I stamped the sentiment and the snowman. 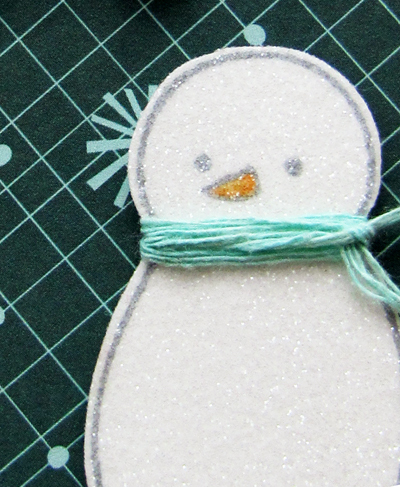 The snowman was also stamped onto some plain white card stock, and before stamping I removed any ink on the buttons. 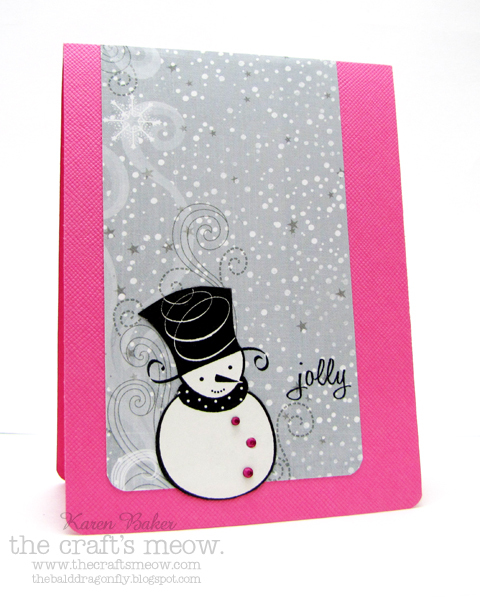 He was then fussy cut and mounted to the card, and I finished him with bright pink button bling. With all the hustle and bustle this holiday season, I had forgotten that it was my day to showcase products using the beautiful December Card Kit from Artful Delight! My wonderful and talented teammate Rose agreed to switch with me this week, thanks Rose! So without further ado, may I present to you some winter wonderland cards! 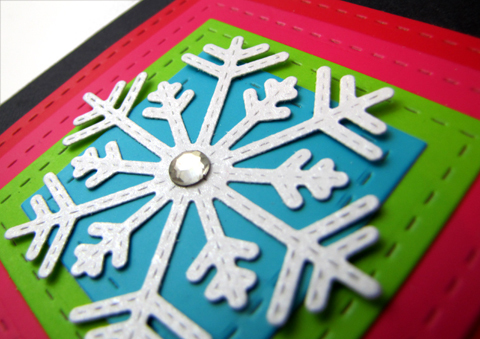 There are some beautiful flocked chipboard snowflakes in the kit, so I decided to pair one with one of the many patterned paper offerings and followed the Artful Delight card sketch this month. 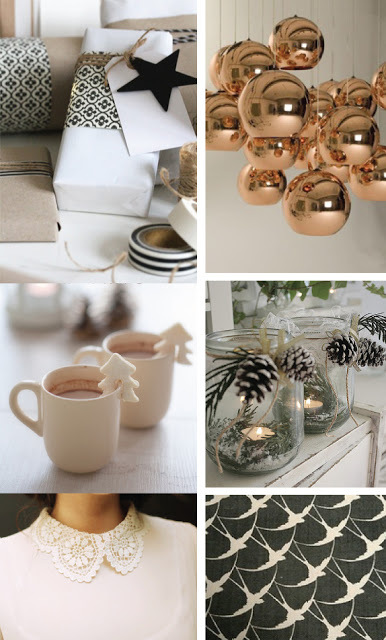 I gathered some rustic, clean and simple inspiration from Lynn's blog, she features this style so well. Everything on this card came from products from the kit with the exception of the burlap string, which is May Arts. This next card is also a take on the sketch, but it ended up having a more playful feel. I really like that you can achieve two different styles with one sketch and one kit! 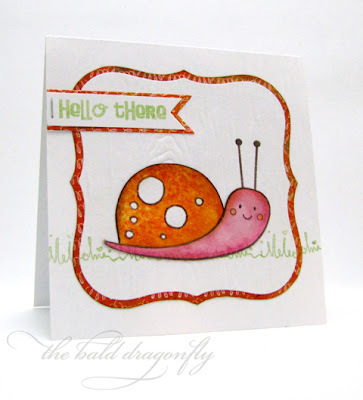 Now this card does feature everything from the Artful Delight December Card Kit-even the fun Paper Smooches Stamp Set is included! 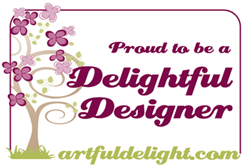 Check out the two sketches available on the sidebar at Artful Delight Blog and link up your entry by December 23rd for a chance to win a kit! Show off your clean and simple creations featuring scoring at CAS-ual Fridays this week. What better sponsor to have than Scor-pal! You can check out the amazing inspiration from the Girl Fridays, read more about the challenge details and rules and find out about the sponsor and prize at the CAS-ual Fridays Blog. I wanted to go old-school vintage, with a modern twist, on my clean and simple creation, so I chose to stamp lightly a postcard image onto some ivory paper. 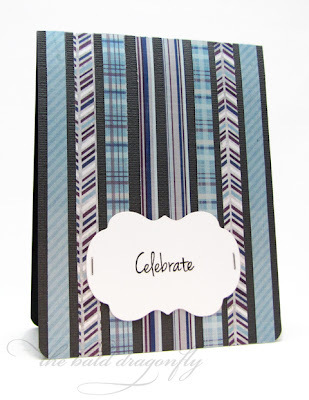 I added a diagonal, scored strip of midnight blue patterned paper for some movement. 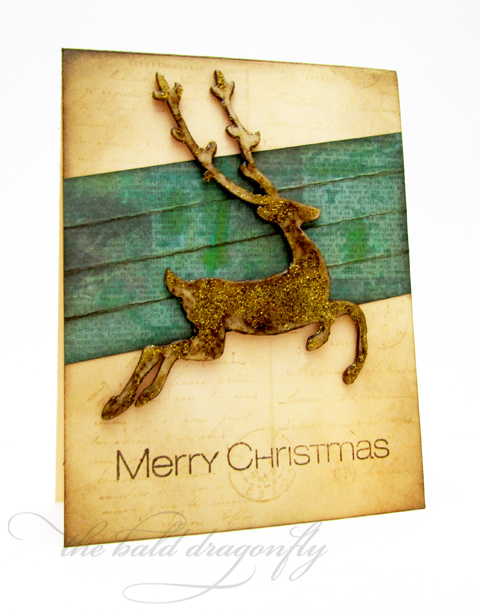 I covered a wooden reindeer embellishment with distress ink and touches of gold glitter to replicate vintage ornaments and adhered it to the card in the same direction as the scored panel. 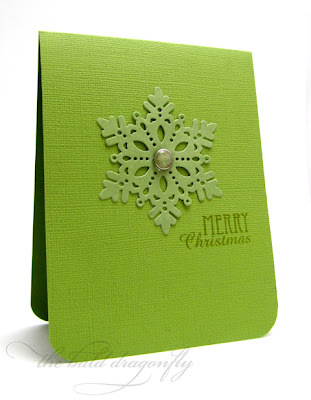 I finished the card with a stamped greeting from Snowflake Greetings by CAS-ual Fridays Stamps. 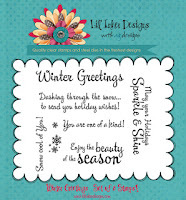 CAS-ual Fridays Stamps and the Girl Fridays are celebrating Hanukkah by showcasing eight nights of inspiration with projects made with 8 Happy Nights. If you wish, you can see previous nights at the CAS-ual Fridays Stamps Blog. Happy Hanukkah to those that celebrate! 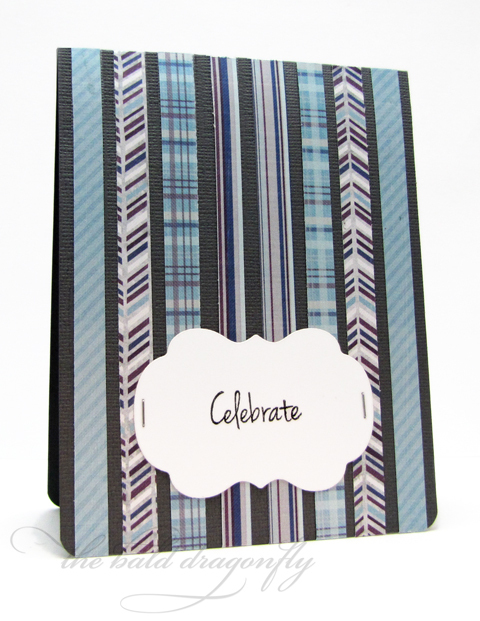 I chose to create a card with references to the celebration but could be used for multiple occasions. There are eight strips of patterned paper from Echo Park's Winter Wishes Collection adhered to a grey card base for a decorative backdrop to the focal point- a simple sentiment from 8 Happy Nights stamped in black onto a die cut panel that had been stapled to the card base. 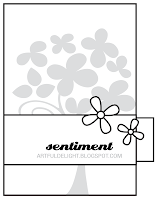 I think this design would be fun, and quick, easy and economical to recreate for birthday invitations or card sets (switch up the colors and patterns). I wanted to showcase one of the most simple and quickest ever table top decorations created with 8 Happy Nights as well: if I did celebrate Hanukkah I would have these votive candle bands all over my house! 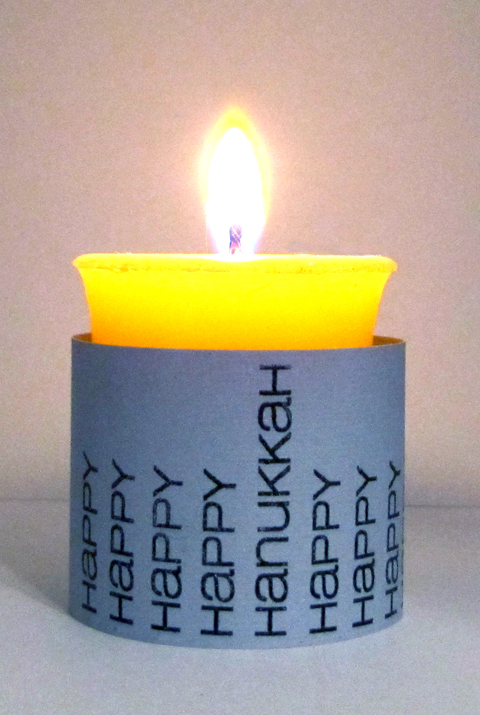 I simply stamped the Happy Hanukkah image onto a one and half inch tall by 5 inch wide piece of plain card stock and stapled the ends together to form a loop and slipped that over a votive candle. Michele did a fabulous job designing this set, I really like the mix of fonts and bold images! Happy Hanukkah to those who do celebrate this joyous holiday! Saint Valentine was imprisoned for performing wedding for soldiers who were forbidden to marry. During his imprisonment, he is said to have healed the daughter of his jailer and before his execution, he wrote, "from your Valentine" as a farewell to her. ~exert from here. This was such an easy card to make! I stamped one of the speedometer images from Zoom Goes My Heart with grey ink multiple times onto textured card stock, came back to add the odometer image and words (these are my favorite parts of the set! 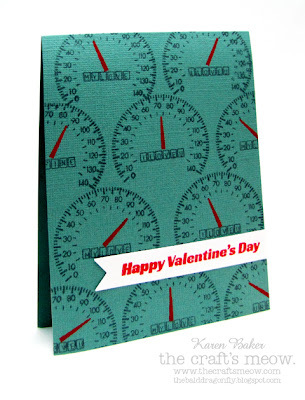 I LOVE U, MY LOVE, UR FINE) and then finished the custom background by stamping the meters in red chalk ink. I finished the card with a banner stamped in one of the larger images from the set. 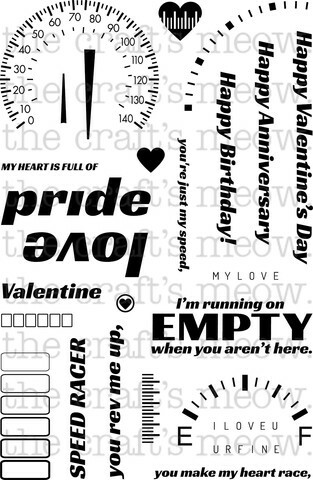 To help celebrate your Valentines this year with a homemade creation, The Craft's Meow is offering a sale on 9 loved themed stamp sets (find them all here!) ...15% off through December 16th! Enter the code Valentine at checkout. As usual, there is a prize up for grabs! One lucky person who leaves a comment on the store blog post will win All You Need is Love. The contest goes through December 14th at 9:00 pm Pacific. Your next stop on the hop is Lin Brandyberry! May your holidays Sparkle and Shine! 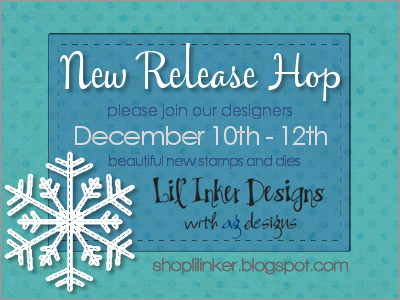 Lil' Inker Designs is having a mini-release for the month of December. 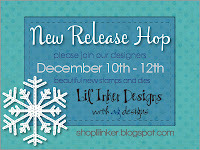 If you are following the hop that started on the Lil' Inkers Blog, then you should have arrived from Jen Carter's blog! 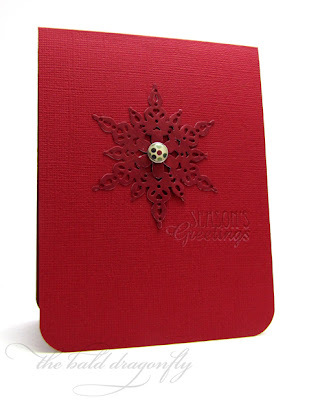 I've got a bright, happy card today with lots of sparkle and shine just for the holidays! 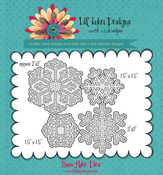 It features this month's release of Snowflake Dies (a set of four! 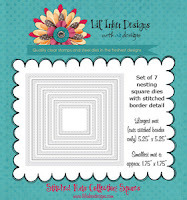 ), Stitched Squares (set of seven nested dies!) and a sentiment from Winter Greetings stamp set along with one large rhinestone gem and bold, neon paper. 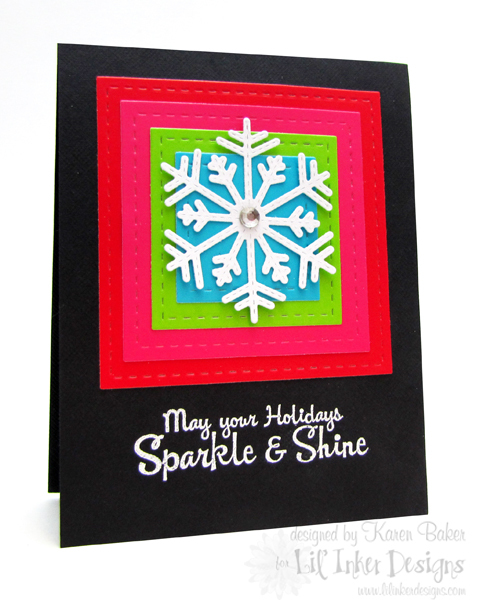 I love the neon look paired with the shimmer and shine on the snowflake. I'm entering this into Moxie Fab World's Keen on Neon Challenge! There's a prize of a $10 gift certificate to Lil' Inker Designs hidden on on of the blogs from yesterday, today and tomorrow, so leave a comment at the stops for your chance to win! For more inspiration, head on over to Alicia's blog! Poppin' in really quick to let you know about the May Arts/Lawn Fawn Blog Week! My project is up today, and you can comment for your chance to win (as in a Lawn Fawn stamp set of choice)! I was just asked by my son recently, as he walked in from the outside all bundled up and with cheeks rosy red: Mama, what did you like best about playing in the snow when you were little? I thought for a while 1. because it has been a long time since I've thought of snow as being fun-mostly it is a nuisance to drive in and 2. it's been a long time since I was little. I finally replied: Your aunties and I used to build tunnels that spanned the length of the driveway. His eyes lit up like he's never thought of that before and said: Well, I'll just have to try that next! 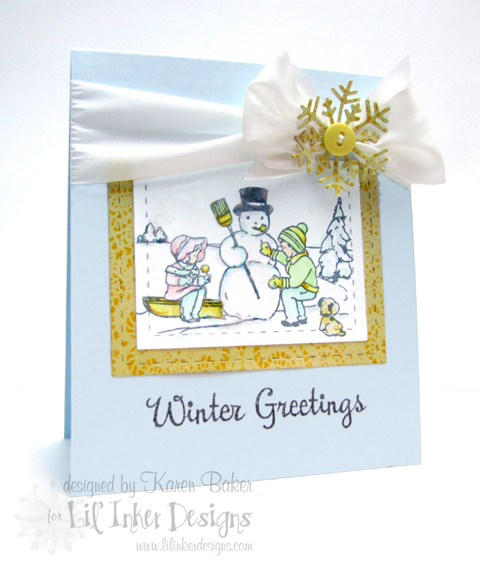 My card today combines the super sweet winter image, A Snowman's Soul, from last month's release along with this month's Snowflake Dies (a set of four! ), Stitched Squares (set of seven nested dies!) and a sentiment from Winter Greetings stamp set. The silk ribbon is from May Arts. There's a prize of a $10 gift certificate to Lil' Inker Designs hidden on on of the blogs from yesterday, today and tomorrow, so leave a comment at the stops for your chance to win! For more inspiration, head on over to Debby's blog! Everyday I'm thankful for the friendships I've made through crafting. Today Erin and I are celebrating Jen's Birthday with a Carbon Copied Post! We are both featuring Retro Foundations by The Craft's Meow and were inspired by the inspiration picture at Jay Gee's Nook. I gravitated towards the graphic packaging in the top left corner so I stamped a few rows of one of the patterns in Retro Foundations, mounted that on top of two strips of Gold May Arts Satin Ribbon and then die cute a large star. 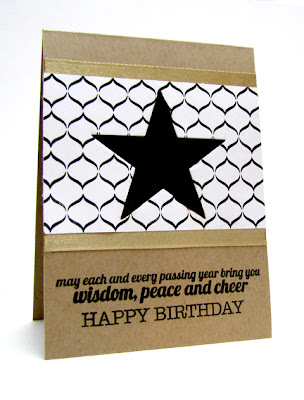 I backed the star with a larger black star and then adhered the panel to a kraft card base and completed it all with birthday greeting (from Retro Foundations and Typically Teen). Jen is one of the most sweetest, most talented ladies I've had the pleasure to get to know. The things she does with ribbon is absolutely phenomenal, and her support and guidance is second to none. Happy Birthday Jen! I hope your day is amazing and just what you hoped for. If you haven't checked out Jen's blog yet, please take a few minutes to do so and wish her a happy birthday while you are there! And please also stop by Erin's blog too (who I would say the same things about!) as she has her version of the challenge up with birthday wishes for Jen too! Playing along with the Cloud 9 December Blog Hop today. I was inspired by the second picture, but as you can see, I left out the red. I wanted something a bit serene, feeling the winter blues maybe? I liked the gray and blue mix of the focal wall. I used a mix of the circle and medallion images from Winter Wishes to create the background, and covered it with a mix of perfect pearls for some shine. The panel was mounted to a kraft card base, due to the chairs in the inspiration picture. The sentiment is from Mehndi Medallions.